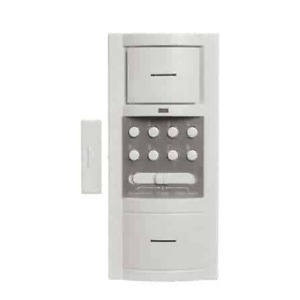 The SL-40 passive infrared door announcer is a self-contained, battery operated, motion detector. It detects the infrared radiations given off from a human body in motion and emits a pleasant sounding chime, alerting you of a visitor. A Reliable Entrance Alert that Installs in Minutes! The product is simple in nature. Simply mount it above the area you want to monitor, like an entrance or a doorway. 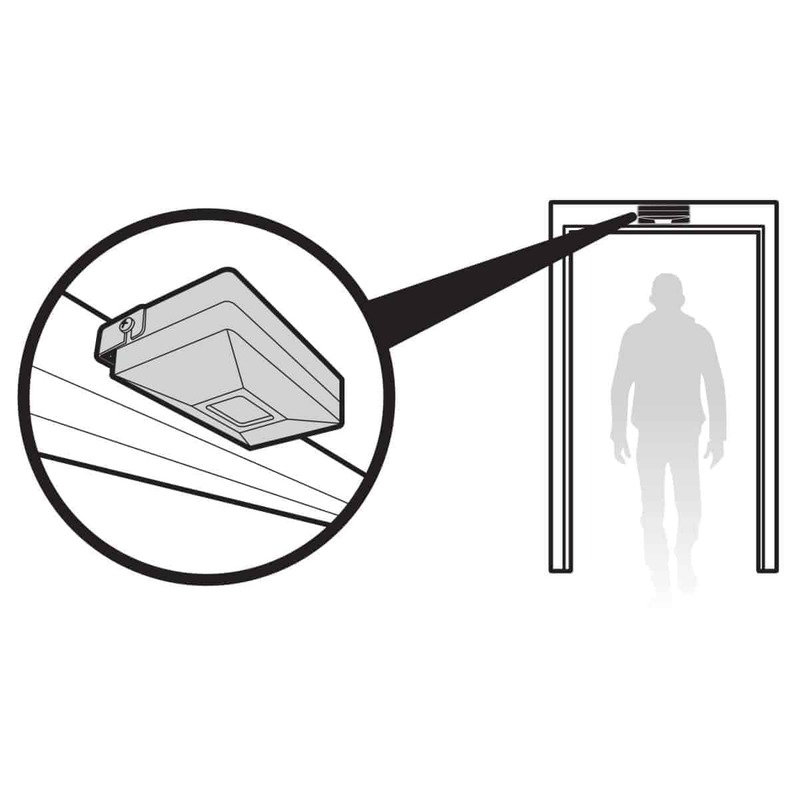 When a visitor passes through the monitored zone, the passive-infrared sensor is triggered. When this happens, a chime sound eminates from the sensor. With an adjustable volume control, you can adjust the sound to the level necessary. The product is ideal for mid-sized offices, shops and stores measuring up to 2,500-3,000 square feet. If you want the chime to sound at a remote location, please see the Rodann Wireless DA-50L-A. The SL-40 is an all-in-one motion detecting unit. When its infrared sensor detects motion, a gentle alarm is triggered. Because it uses infrared technology, the SL-40 is resistant to false alarms – no need to worry about sunlight or reflections setting it off. It will also work when the door is open or closed, making this a reliable product that meets a variety of demands. SL-40 uses a passive-infrared sensor that is triggered with a combination of heat and movement. This helps eliminate false alarms caused by shadows, leaves, etc. Powered by a 9-volt battery. Under normal conditions, battery should last 18-24 months prior to replacement. This was exactly what i needed. The door to my office is around the corner from my desk. Since i couldn't see when people entered, They scared the crap of me all the time. This doorbell was easy to setup and install. No wires, just add a 9 volt and put two screws in. Took less than 5 minutes. Now i know when someone comes in right away. I did turn the volume down on it, just enough so i can hear it but it doesn't get annoying. Product is easy to install and has a couple options for sounds which are short and sweet, perfect for a shop front or office entryway. Only downfall is that it picks up on the movement of the door when it closes so it makes a noise when somebody enters and also when the door shuts automatically behind the person (they are already far past the sensor at this point so it's definitely picking up the door movement not the person) overall a great product, does the trick! Using this as a door chime alert when someone enters the office. Using this as a door chime alert when someone enters the office. Tried the wireless doorbells which worked fine until mounted on two aluminum frame doors. This is just a one piece motion sensor that works as designed. Volume is adjustable as well as the tone. Very easy to install. This is just what I was looking for at my business location in Costa Mesa. This is just what I was looking for at my business location in Costa Mesa. I explained what I needed to a few local hardware store employees. I even said, "You know... Bing, Bong". They gave me the RCA dog look.I received a suggestion for a $150 solution and security system. Thank You 1800DoorBell.